Rafters brave the Class III-V whitewater in the Yampa River's Cross Mountain Canyon. Most animals � humans included � live by a code of self-preservation that serves us well. We avoid oncoming freight trains and hardly regret saving our skins. So why would anyone leap from a perfectly functioning plane? The answer is what makes humans wackier than the rest of the animal kingdom. You cross a threshold when you chase thrills. Stepping from a world governed by safety, you enter an adrenaline-flooded fun house where speed, risk and challenge alter your reality. Big fun can mean even bigger consequences � a danger that is itself part of the fun. Ask thrill-seeking Steamboaters why they trade safety for adventure, and you'll likely hear hoit makes them feel fully alive. There's nothing like hurtling through the air headfirst at 120 miles per hour to sharpen the mind, to banish distractions like the status of your checkbook, that seem insignificant when your very survival depends on what you do next. Adrenaline sports force us to focus, Zen-like, on just one thing, to clear our cluttered heads and exist in the moment. As for safety � wisdom holds that a boat in the harbor is safe. But that's not what boats were made for. Just because it's all downhill doesn't mean it's easy. Rolling at highway speeds of up to 60 miles per hour, downhill mountain bikers need specialized bikes that perform like motorcycles, with 8-inch shocks on front and rear wheels to absorb rocky terrain and massive drops. Bikers also have to be super-fit, and maybe a little crazy. "There are times when you have to pedal and go really hard," explains Steamboater Gina Grether, a downhill mountain biker who's ridden pro for five years. "You never sit down while riding, you never get a break. You just have to go for it." A three-time national champion who tied for fifth in world competition, Gina, 39, doesn't often make mistakes, though she says downhilling always offers nechallenges and demands neskills. One race included a distance jump of 30-plus feet. "I love that, �heck yeah, I did that!' feeling," she exclaims. Gina says downhilling sets her free. "It's the way I meditate in action," she says. "I'm completely in the zone when I do it." Steamboat has permitted downhill bikes on its lifts and trails since 2005, and Gina is glad for the local opportunity to build her fitness and practice her turns. Her 15-year-old son, Elijah, also rides in Steamboat and made the junior team as a downhiller. "It's a good sport," Gina attests. "It's a little scary to knomy son will hit a 25-foot jump, but it makes him feel good. It builds personal confidence and strength that's all his own." It's hard to imagine anyone boating boulder-studded Fish Creek. For one thing, there's 283-foot Fish Creek Falls, which is visited by thousands but floated by none. And even if you put in belothe falls, you're still looking at a steep mountain stream, dropping 150-200 feet per mile, littered with downed trees and rocks, all practically unavoidable in the narrochasm of the creek bed. This is class IV and V water, and to local paddlers like Scott Gerber and Nick Hinds, running the likes of Fish Creek is kayaking at its best. "Creek-boating is challenging, and it's exciting, and lots of times you're doing it in a wilderness setting," explains Scott, 57, who has paddled steep, low-volume streams for more than 10 years. "It can be hard, if not impossible, to scout things beforehand, so you have to quickly assess what's coming at you and react accordingly," he adds. "It's about testing your skills in an environment that can have real consequences if you mess up," says Nick, 24. "If you're upside down, you know you're going to hit something," Scott adds. That's true even during spring runoff, which is the only time kayakers can even attempt to paddle mountain streams like Fish Creek. The season lasts from May to late June, when flows on local creeks top out at 800-900 cubic feet per second. Since peak times are in the evenings, after daytime temperatures squeeze even more water out of the snowpack, creek-boating is a thrill Scott fits in after work. Despite the risks � or perhaps because of them � the sport helps him decompress. "It's a complete focus," he explains. "I'm not thinking about the mortgage or the next day's work. I'm totally in the moment." Jake Booco rides against the clock and the bull. 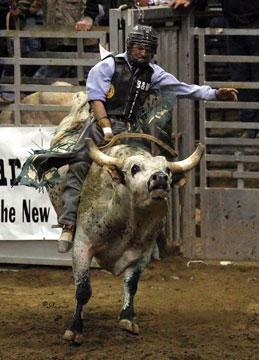 Bull riding is considered the grand finale of any rodeo � the evening's dessert. Usually bull riders are the last to compete, though they also appear occasionally between events like bronc riding or calf roping. "When that happens, I usually say, �Folks, we're gonna have dessert twice tonight,'" explains rodeo announcer John Shipley, a Steamboater who describes his own rodeo career as "mercifully short." John says spectators love bull riding because of the spectacular mismatch of human and animal, a contest that's so clearly dangerous. "People either think (bull riders) are idiots, or they've got huge huevos," John says. Whatever the reason, bull riders risk their lives each time they climb aboard a 1,500-pound bull and hang on while it bucks for eight seconds. Of course, getting off may be even harder than getting on, since dismounting clear of the bull's trampling hooves is the trickiest part of what has been hailed as the most dangerous of all sports. Hayden resident Jake Booco, 21, was born in Steamboat and norides bulls professionally, earning more than $30,000 annually in rodeo competition. He admits that the danger is always in the back of his mind, but says the worst thing you can do is to worry about it. "When you think about what can happen, it will mess you up," Jake says. His own injuries include shoulder and knee surgeries, a broken arm, several concussions and what he calls "bumps and bruises," but the excitement of his sport makes it all worthwhile. Insists Jake, "I love to ride bulls." Ken Grubbs has been hang gliding since 1974. That's when he sathe newfangled sport featured on the cover of Popular Mechanics and decided to give it a try. "Back then, no one kneanything about it," he recalls. Nohe heads up the Storm Peak Hang Gliding Association, a group of about seven Steamboat flyers who are occasionally joined by Front Range friends. 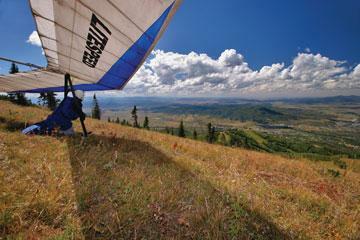 According to Ken, Steamboat is a wonderfully convenient place to fly. "Access roads will take you all the way to the top of Mount Werner, about 3,500 feet above the valley floor, and the mountain is west-facing, which lets you catch prevailing west�northwest winds. It's very nice," Ken explains. Hang glider pilot Steve Ford prepares to take off from Mount Werner during the Labor Day Fly-In. While most hang gliding hangouts are in remote areas, "out in the middle of nowhere," Ken says, Steamboat boasts restaurants, shops and activities that non-flying family members can enjoy. Pilots like the conveniences, too. When more than 40 hang gliders from several Western states joined the local group to take part in the 2005 Labor Day Wild West Air Fest, they loved knowing dinner was just minutes away from landing. Denying that hang gliding is a risky sport, Ken, 53, insists, "We're aviators, just like any other pilots. It's just a different type of aircraft." But he acknowledges that it's still slightly safer to remain on the ground than to soar unmotorized through the air, admitting, "The shared risk makes for some pretty close friendships." For Mark Cahur, who incorporated the nesport of paragliding into the Storm Peak club, it's human nature. "Really, it's just man's oldest dream realized � soaring in the sky with the birds." "In Europe, rally racing is huge," explains Jim Gill, a former rally racer who nochairs the Colorado Cog Rally, a national competition held every September in Hayden. In the U.S., the sport is less well-known, but no less exciting. "It's about pushing yourself to the limits of speed and common sense, right on the ragged edge � without going over," Jim describes. "It's intense." Teams of two, a driver and navigator, compete on a variety of road surfaces, anything from mud to boulders to gravel. Teams don't get to study the course or practice on it before the race, which means there's no second chance to get things right. Rally cars are road-legal but highly modified to amp up safety, durability and speed. Racers average 70 mph, with occasional sprints approaching 120 mph. Those modifications don't come cheap � the best cars cost upwards of $500,000 � and driving them tests one's physical and mental endurance. "You've got to have a high sense of adventure, like to be challenged," Jim says. "There's an exciting adrenaline rush when everything's going well," he explains. When things go wrong, "it's the pits!" he admits. It's an outdoor sport so races run no matter the weather, and that can cause teams trouble. "That's rally racing," Jim declares. "Accommodating the elements is part of the fun." At one point, more than 40 skydivers lived in Steamboat Springs. For 13 years, Joe Pete LoRusso helped run a local skydiving club and organized jumps using the club's plane. But when the plane broke seven years ago, the crowd thinned out, leaving just a handful of diehards. Joe Pete is one of them. 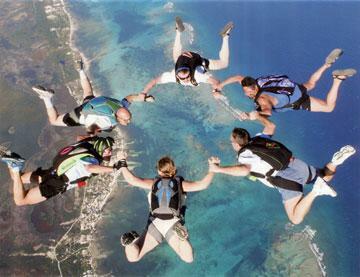 Joe Pete LoRusso (top left corner) and friends jump in Belize. "I'm an air junkie," Joe Pete laughs. "Anything to get my knees in the breeze." He makes 100-150 jumps per year, amounting to a lifetime total of well over 1,000 (though only 950 are officially logged). Last Labor Day he counted seven jumps � six in Steamboat during the air show, and one in Oak Creek, a 10-year tradition. After the parade, Joe Pete and friends Tom Corl, Dave Wallace and 83-year-old Jake Schwan jump into Decker Park, competing to see who can land on the Dinty Moore pizza pan in the middle of the field (the winner gets a free pizza). Joe Pete says he loves going fast, "120 mph flat and stable, and blowing through 200 miles an hour standing on your head." He jumps with two parachutes because he has experienced chute failures � "that can be a little unnerving," he says � and the rules require jumpers to have an open canopy at 2,000 feet. "That's when you're 11 seconds from impact." Until then, he's in a freefall that makes him feel very much alive. "You've got to try it to knowhat it's like," he says. "It's the adrenaline rush of a lifetime. Some people just got to live close to the edge. Personally, I have to step off."